Evolution is probably the most misunderstood concept on the planet. I still have some misconceptions to this day, I'm sure. I was an English major who grew up in Southeastern US public schools. I have no recollection of evolution being taught, and have been playing catch-up for quite some time. 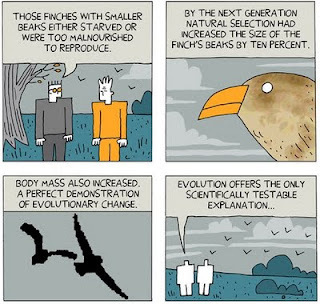 I never really doubted evolution, for some reason, but I just didn't totally 'get it.' When it finally clicked for me, after a devouring a handful of well-written primers on the subject, it was as if I'd unlocked a whole new way of looking at everything. Which I had. When you fully understand that every living thing shares an ancestor with every other living thing, it has a profound effect on how you view those things. 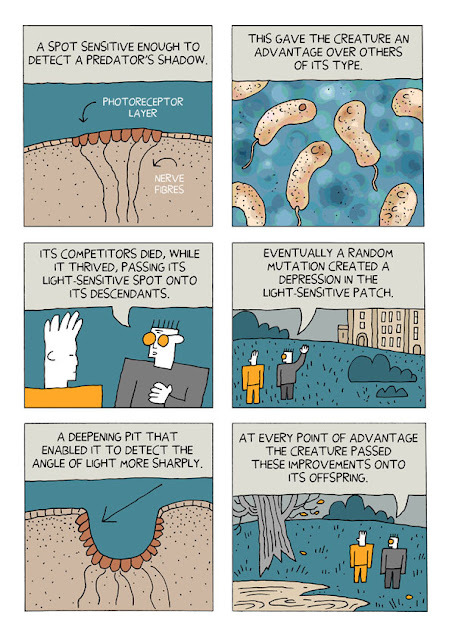 And when you understand how biological complexity arises in nature, you start to see examples of more complex, and less complex, mechanisms all around you. You begin to see that many of the concepts and mechanisms found in evolution also have applications in non-biological areas, such as technology, religion, language, art, etc. A recent Gallup poll shows that 4 in 10 of Americans do not accept evolution. Granted, most of those who deny evolution do so because of their literal readings of scripture. But, I do believe that, in addition, part of the problem is that people have misconceptions and misunderstandings about evolution. They either have been willfully given misinformation by an opponent of evolution, or they have been the victim of oversimplifications, or flat-out wrong assumptions, such as the much-repeated fallacy that humans evolved from monkeys. I've often thought that evolution could really use a boost from CGI. I realize that there have been some short, and minor uses of CGI to demonstrate aspects of evolution on television documentaries, but I would love to see either a full-length documentary or a mini-series that really plunges in depth, leaving no stone unturned. I’ll call it the hairpin thought experiment. Take a rabbit, any female rabbit (arbitrarily stick to females, for convenience: it makes no difference to the argument). Place her mother next to her. Now place the grandmother next to the mother and so on back in time, back, back, back through the mega years, a seemingly endless line of female rabbits, each one sandwiched between her daughter and her mother. We walk along the line of rabbits, backwards in time, examining them carefully like an inspecting general. As we pace the line, we’ll eventually notice that the ancient rabbits we are passing are just a little bit different from the modern rabbits we are used to. But the rate of change will be so slow that we shan’t notice the trend from generation to generation, just as we can’t see the motion of the hour hand on our watches – and just as we can’t see a child growing, we can only see later that she has become a teenager, and later still an adult. An additional reason why we don’t notice the change in rabbits from one generation to another is that, in any one century, the variation within the current population will normally be greater than the variation between mothers and daughters. So if we try to discern the movement of the ‘hour hand’ by comparing mothers with daughters, or indeed grandmothers with granddaughters, such slight differences as we may see will be swamped by the differences among the rabbits’ friends and relations gambolling in the meadows round about. Nevertheless, steadily and imperceptibly, as we retreat through time, we shall reach ancestors that look less and less like a rabbit and more and more like a shrew (and not very like either). One of these creatures I’ll call the hairpin bend, for reasons that will become apparent. This animal is the most recent common ancestor (in the female line, but that is not important) that rabbits share with leopards. We don’t know exactly what it looked like, but it follows from the evolutionary view that it definitely had to exist. Like all animals, it was a member of the same species as its daughters and its mother. We now continue our walk, except that we have turned the bend in the hairpin and are walking forwards in time, aiming towards the leopards (among the hairpin’s many and diverse descendants, for we shall continually meet forks in the line, where we consistently choose the fork that will eventually lead to leopards). Each shrewlike animal along our forward walk is now followed by her daughter. Slowly, by imperceptible degrees, the shrew-like animals will change, through intermediates that might not resemble any modern animal much but strongly resemble each other, perhaps passing through vaguely stoat-like intermediates, until eventually, without ever noticing an abrupt change of any kind, we arrive at a leopard. 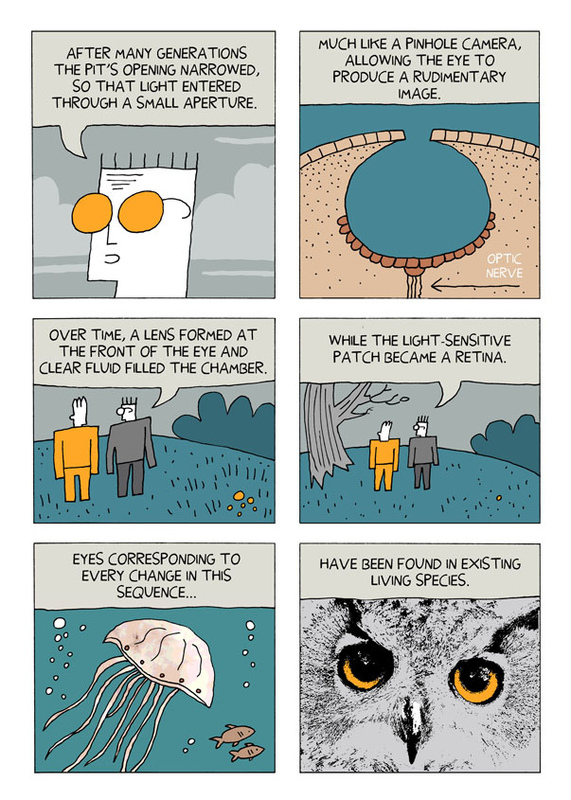 Various things must be said about this thought experiment. First, we happen to have chosen to walk from rabbit to leopard, but I repeat that we could have chosen porcupine to dolphin, wallaby to giraffe or human to haddock. The point is that for any two animals there has to be a hairpin path linking them, for the simple reason that every species shares an ancestor with every other species: all we have to do is walk backwards from one species to the shared ancestor, then turn through a hairpin bend and walk forwards to the other species. Fortunately, Dawkins' thought experiment is so elegantly written that we really don't need CGI to grasp it, but then again, we have the pesky problem of how to get that 40% of Americans to pick up a Dawkins book. There are some other really wonderful (and accessible) books by less-controversial figures, such as Jerry Coyne, Sloane Wilson, and many others. We also have a rising number of graphic artists serving up some pretty amazing works. 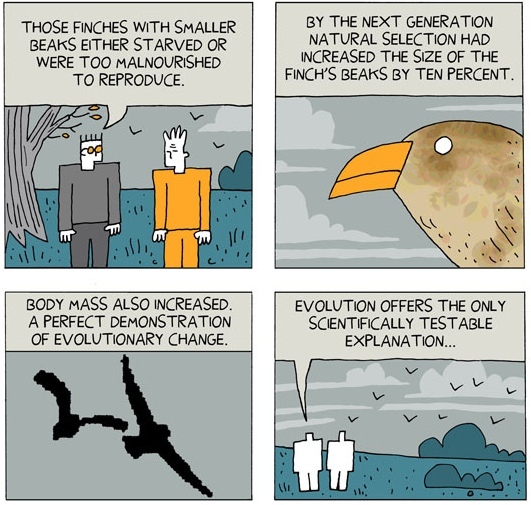 There's Jay Hosler's Evolution: The Story of Life on Earth and Michael Keller and Nicole Rager Fuller's Charles Darwin's On the Origin of Species: A Graphic Adaptation. 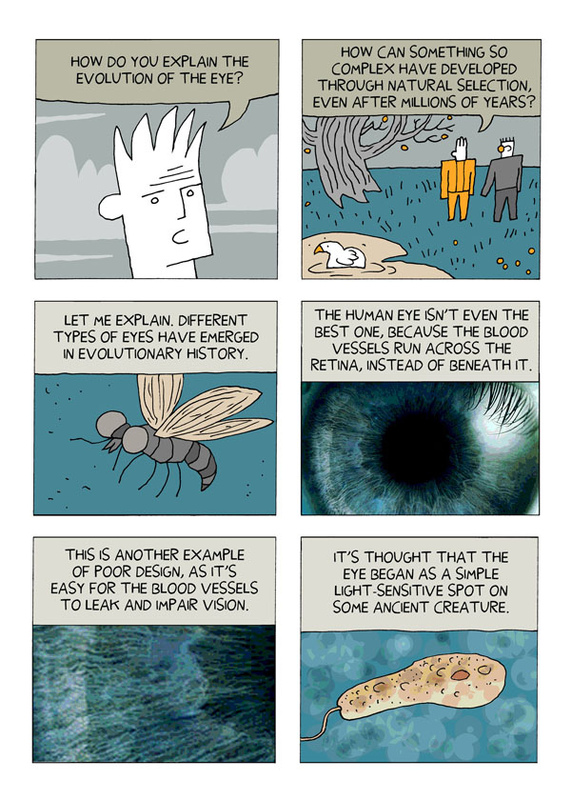 And then we have Darryl Cunningham's forthcoming book, Science Stories, which will feature a version of an amazing comic strip about Evolution (he says the version on his blog is a beta version). What I love about Cunningham's comic is his approach from the perspective of two people who are discussing evolution. One doesn't understand it, or does not accept it, and the other is very comfortable addressing these questions (all very common questions that we see time and time again). Cunningham allows us to learn about evolution through doubt, which is really how it works in real life for so many Americans. I hope that Cunningham's strip receives a lot of attention, and hopefully reaches a much wider audience. At least until we have that CGI IMAX 3D movie I've been dreaming about. Again, I urge you to check out the entire piece.